One of the most amazing “historical facts” widely believed by the Islamic world is that no Jews or tribes of Israel ever lived in the Holy Land. Such belief, of course, negates the validity of the Bible. The Scriptures, from their point of view, are a fairy tale. No King David or Solomon ever existed. No Temple was built in Jerusalem and no shepherds in Bethlehem saw angels sing. Over the years, Israel has watched helplessly as hundreds of tons of archeologically rich earth on the Temple Mount were hauled off in trucks and thrown into wadi dumps. These Muslim keepers of the Temple Mount (which now contains the Mosque of Omar) has done all they can to make sure that no remnant of ancient Israelite civilization remains. 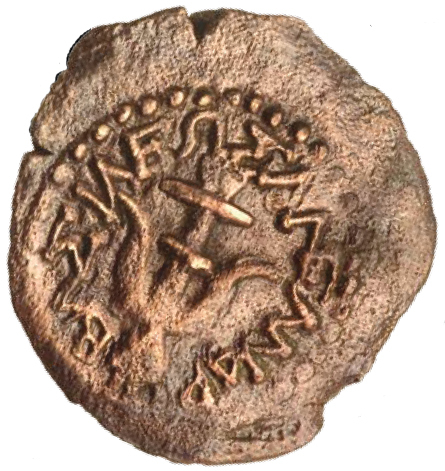 In the world of academia, and Biblical archaeology, scholars of revisionist history have cast the shadow of doubt over Judaism’s intrinsic connection to Jerusalem. In fact, there are scientists who are currently in the business of trying to prove that King David and his reign are entirely fictional. 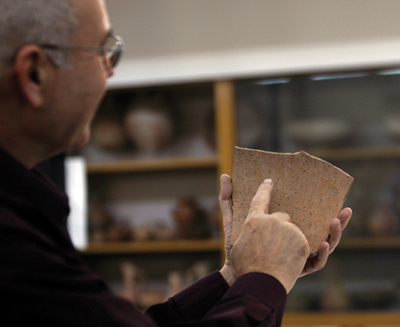 Archaeologist Yosef Garfinkel of the Hebrew University exhibits a shard of pott ery which contains the oldest known Hebrew writing. Over 3,000 years old, it was discovered while excavating a fortress city overlooking the valley where David slew Goliath. 1 You shall not do [it], but worship the [Lord]. 4 the widow. Rehabilitate [the poor] at the hands of the king. 5 Protect the po[or] the slave / [supp]ort the stranger. Nevertheless, until now there did not seem to be any archeological proof that there was a developed written language in Hebrew during King David’s time (let alone Moses’). That would mean, of course, that there was no David who killed Goliath or wrote Psalms that have been sung and prayed for 3,000 years. Indeed, much secular biblical scholarship has been skeptical of the true authorship of early biblical writings in the Hebrew language. These scholars were convinced that written Hebrew developed only in the 6th century B.C. Which brings us to the subject of the present ownership of the West Bank. For those who believe the Bible is true, the location of the Promised Land to Jacob (renamed Israel) and his fathers, Abraham and Isaac, couldn’t be clearer. Genesis describes the places where God supernaturally talked to the Patriarchs who received the everlasting promise, and who dwelt in the cities and towns that every Jew and Arab living in the Middle East today know by name. Shechem, Bethel, Ai, Hebron, Beersheva, Gerar (in Gaza) were all cities where God spoke to the Fathers, vowing over and over to give them this land as an everlasting inheritance. In fact, I think it is quite amazing that God would repeat Himself so many times about the land. One might wonder why the divine emphasis should not be solely on things of the soul and spirit. But God addressed the issue of ownership of the land from one end of the Bible to the other. The promises to Israel include land to the Euphrates River, land that I do not believe Israel will possess – until Israel’s great revival takes place which the prophets and the Apostle Paul foretold. But here is what I think is interesting – and to me is just one more proof that there are spiritual forces at work over this land. Every place that the Patriarchs lived – except Beersheva – are the very places that Allah, the god of the Muslims, has claimed most vehemently as his own. cities in the West Bank, is where the Muslim population is concentrated. But Shechem is the first place that God spoke his promise of the land to Abraham. Hebron is where Abraham lived and built an altar to the Lord. It is where he and Sarah, Isaac and Rebecca and Israel and Leah are buried. It is because of these lands promised by the God who calls Himself the God of Israel, that the Jewish nation is being attacked through terrorism, through UN manipulations, through sophisticated Muslim media PR, through international judicial activities, and through the Palestinians’ oil-rich brothers. What’s more, Israel is being increasingly assailed by Europe - once Israel’s ally - but now, bending towards its Islamization, turning intensely anti-Zionist, that is, anti-Israel. Into this boiling pot, US President Barack Obama has entered. He made a serious mistake in his first trip to the Muslim world when he declared before an approving Egyptian audience that Israel must freeze all of its construction of housing in Judea and Samaria, including East Jerusalem immediately. Now, about 300,000 Israelis live in West Bank and another 200,000 in East Jerusalem. 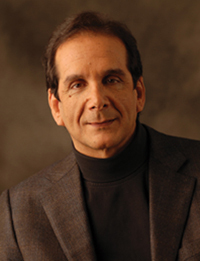 As Charles Krauthammer so adroitly explains in the following article, freezing all construction for half a million civilians living in a Western democracy is simply impossible. Surely Obama, even though new in the White House, would have had advisors who could explain the facts of life to the president. This sequence of events which was supposed to move negotiations along, but then backfired, has been repeated over and over again. It goes like this: The US demands more concessions from Israel. The Palestinians, offering nothing in return, happily harden their negotiating position. Until two months ago, President Mahmoud Abbas had never demanded a settlement freeze in order to take part in peace talks. But as he explained to the London-based Asharq al-Awsat newspaper, he could not afford a situation in which Obama appeared more Palestinian than the Palestinians. So we ask ourselves, why would Obama decide to publicly browbeat Israel in front of a Muslim (world) audience? Surely he knew that Israel couldn’t and wouldn’t freeze all construction. His reasons had to be to win favor with the Muslim nations. Under immense pressure from the US, and terrified of losing our last strong ally, two months ago Israel’s Prime Minister Benjamin Netanyahu instituted a ten-month moratorium on new buildings in the West Bank. But he also declared that buildings already under construction would continue, and he would not agree to stop any construction at all in Jerusalem. The Palestinians of course did not accept the “partial freeze.” They do not want one nail to be hammered throughout the 120 Jewish towns and villages in the West Bank. And until Israel’s settlers become a “freeze frame,” Abbas has found yet another reason to continue to stall negotiations with Israel. Israelis understand the Palestinian Authority’s chess game. President Abbas believes he can achieve the goal of total settlement freeze if he just sits back and waits. After that, he will then add that he cannot negotiate until Israel promises to move back to the difficult-to-defend 1949 cease-fire lines (meaning giving up all of East Jerusalem and all of Judea and Samaria). He has publicly stated that he is in no hurry because he believes that time is on his side. His plan is to do nothing and just wait for Obama and the European Union to pressure Israel into more concessions. Abbas’ next move then would be to demand all of the Palestinian “refugees” – a few million – to have the right to populate Israel proper, thus destroying the fabric of the Jewish state. Abbas is convinced that as long as he keeps rejecting a negotiated settlement, the European Union will back his position completely and give the Palestinians a state on a silver platter. All of Israel’s demands – including the end of terror and a demilitarized Palestinian state – he will ignore. His goal is not a Palestinian state alongside Israel. As he explains in Arabic to his constituents, his goal is the destruction of the Jewish state. Unknown to most of the world, terrorism has decreased in Israel (mostly because of the fence Israel built and Israeli security overseeing the West Bank) and the economy on the West Bank is growing. Unemployment has gone way down to 18% (compared to 40% in Gaza). The local stock market is on an upswing along with foreign investment. New shopping malls, suburban homes for the middle class and a new industrial area in Bethlehem is in the works. But what is so disappointing to Israelis is that the relative prosperity of West Bankers has not made them more inclined to make peace with Israel. Polls say that if elections were held in the West Bank today, the Arabs would elect by a massive landside none other than Marwan Barghouti, a jailed Arab terrorist who was convicted of killing five Israelis. Incredibly, he coordinates Palestinian politics from jail with his cell phone and has rumbled about starting another Intifada if he is freed in an exchange of prisoners for Israeli kidnapped soldier, Gilad Shalit. 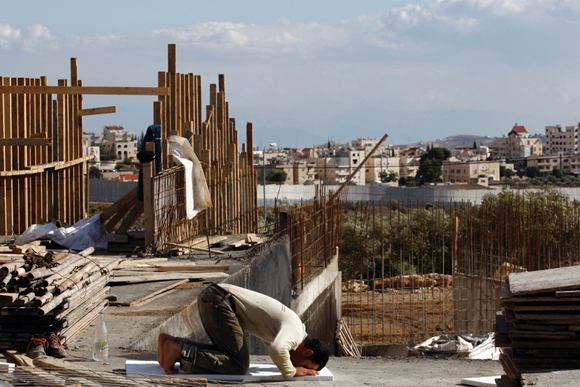 Another Intifada against Israel would bring great economic damage to the West Bank. Israel would have to rebuild the traffic barriers throughout the West Bank to keep terrorists from filtering into Israel, greatly curtailing commerce and travel. So what is this driving force toward Palestinian self-destruction? What would cause them to desire to support terrorism and work to annihilate Israel instead of building a prosperous economy in their cities and towns? The answer is that the Palestinian leaders, past and present, have refused to prepare their people for coexistence with the Jewish state. The state schoolbooks beginning in kindergarten, teach the glories of suicide bombers and the ultimate victory of sharia law over the Jews. Their television stations and Imams preach their fury against the existence of Jews “who have no roots in the Middle East and who have stolen the land from Allah’s people.” Their promise of 72 virgins for martyrs is still good. As you might imagine, even the “temporary” 10-month freeze in the West Bank is causing great hardship to Jewish citizens of Judea and Samaria. With a population of 300,000 people, all kinds of plans have been disrupted. Contractors who have received down payments, purchased land, paid for all the licenses, and engineering work, and who have invested heavily in a project even before the foundation is laid, face bankruptcy. Meanwhile Obama’s Mideast envoy, George Mitchell, is trying another approach. He has hinted that the Obama administration might just decide to withhold its loan guarantees (guarantees that allow Israel to obtain loans at lower interest) if Netanyahu does not order a complete halt to Jewish building. As the Jerusalem Post editors stated: “It’s too bad that the Obama administration, which came to Washington promising change, is going down the old, demonstrably counter-productive road of its predecessors. It, too, fundamentally misreads the source of Arab reluctance to make peace with Israel. “Washington acts as if both sides want the same thing: coexistence. But the Arabs still reject the right of a Jewish state to live anywhere in their midst; still favor demographically inundating Israel with Palestinian refugees and millions of their descendents; and still insist Israel pull back to the hard-todefend 1949 Armistice Lines. What’s the issue? No “natural growth” means strangling to death the thriving towns close to the 1949 armistice line, many of them suburbs of Jerusalem, that every negotiation over the past decade has envisioned Israel retaining. It means no increase in population. Which means no babies. Or if you have babies, no housing for them -- not even within the existing town boundaries. Which means for every child born, someone has to move out. No community can survive like that. The obvious objective is to undermine and destroy these towns - even before negotiations. To what end? Over the past decade, the U.S. government has understood that any final peace treaty would involve Israel retaining some of the close-in settlements - and compensating the Palestinians accordingly with land from within Israel itself. That was envisioned in the Clinton plan in the Camp David negotiations in 2000, and again at Taba in 2001. After all, why expel people from their homes and turn their towns to rubble when, instead, Arabs and Jews can stay in their homes if the 1949 armistice line is shifted slightly into the Palestinian side to capture the major close-in Jewish settlements, and then shifted into Israeli territory to capture Israeli land to give to the Palestinians? This idea is not only logical, not only accepted by both Democratic and Republican administrations for the past decade, but was agreed to in writing in the letters of understanding exchanged between Israel and the United States in 2004 - and subsequently overwhelmingly endorsed by a concurrent resolution of Congress. Yet the Obama State Department has repeatedly refused to endorse these agreements or even say it will honor them. This from a president who piously insists that all parties to the conflict honor previous obligations. And who now expects Israel to accept new American assurances in return for concrete and irreversible Israeli concessions, when he himself has just cynically discarded past American assurances. The entire “natural growth” issue is a concoction. Is the peace process moribund because a teacher in the Jewish Quarter of Jerusalem is making an addition to her house to accommodate new grandchildren? It is perverse to make this the center point of the peace process at a time when Gaza is run by Hamas terrorists dedicated to permanent war with Israel and when Mahmoud Abbas, having turned down every one of [former Prime Minister] Ehud Olmert’s peace offers, brazenly declares that he is in a waiting mode - waiting for Hamas to become moderate and for Israel to cave - before he’ll do anything to advance peace. In his much-heralded “Muslim world” address in Cairo yesterday, Obama declared that the Palestinian people’s “situation” is “intolerable.” Indeed it is, the result of 60 years of Palestinian leadership that gave its people corruption, tyranny, religious intolerance and forced militarization; leadership that for three generations rejected every offer of independence and dignity, choosing destitution and despair rather than accept any settlement not accompanied by the extinction of Israel. That’s why Haj Amin al-Husseini chose war rather than a two-state solution in 1947. Why Yasser Arafat turned down a Palestinian state in 2000. And why Abbas rejected Olmert’s even more generous December 2008 offer. In the 16 years since the Oslo accords turned the West Bank and Gaza over to the Palestinians, their leaders built no roads, no courthouses, no hospitals, none of the fundamental state institutions that would relieve their people’s suffering. Instead they poured everything into an infrastructure of war and terror, all the while depositing billions (from gullible Western donors) into their Swiss bank accounts. Obama says he came to Cairo to tell the truth. But he uttered not a word of that. Instead, among all the bromides and lofty sentiments, he issued but one concrete declaration of new American policy: “The United States does not accept the legitimacy of continued Israeli settlements,” thus reinforcing the myth that Palestinian misery and statelessness are the fault of Israel and the settlements. Blaming Israel and picking a fight over “natural growth” may curry favor with the Muslim “street.” But it will only induce the Arab states to do like Abbas: sit and wait for America to deliver Israel on a platter. Which makes the Obama strategy not just dishonorable but self-defeating. has established 13 schools for children to study two hours a day who cannot attend regular school because they have to help the family earn a living. They are taught about Jesus, the Bible and about Israel! Up to 60 children of all ages attend each class. There is nothing more humbling or emotionally difficult than to receive a donation from people who come from some desperately poor nation. And who could be poorer than dear saints from Dalits, the “lowest of the low” both in status and material terms, and who live in a remote part of India that is known for its violent persecution against Christians? But that is from where Maoz received a donation of $480. 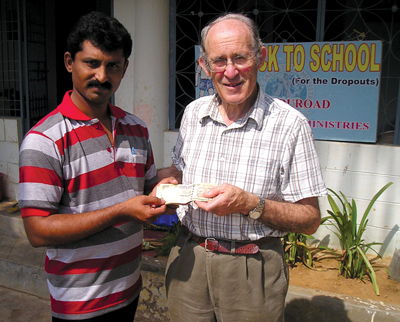 (£300) for the salvation of the Jewish people. Why would one hundred and fifty Indians in a rural village in Andra Pradesh want to come together to pray for Israel and give from their meagre resources to support the work of Maoz Ministries in Tel Aviv? The story starts five years ago when the four of us met Indian Pastor, David Kumar, at the March of the Nations in Jerusalem at the Feast of Tabernacles. He was the sole Indian Representative and had been saving for four years to get there. After 2 years of email exchanges and repeated invitations, we travelled to India to minister with David and his people. 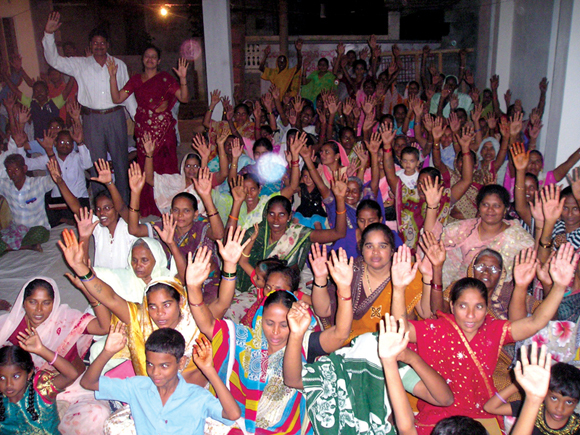 Women’s section of Pastor David’s mother church. He reaches out to many areas where Christians meet in thatched roof churches. We received tumultuous welcomes everywhere, especially when it was discovered that Helen was Jewish. In the thatched mud huts which serve as churches there are pictures of Jerusalem and Israeli flags! These Christians know their Bibles and understand how deeply God loves his people Israel. They have been taught to pray for Israel and were thrilled to be able to support believers in the land. Over one hundred turned up at each “Prayer for Israel” meeting ; we were greeted by joyful shouts of “Shalom, Shalom, Shalom”..
22 of 37 paid for! Each book cost $1,750 to translate, edit, proofread, typeset, print and distribute (£1,270; €1,370). Only 15 books to go! Gordon Lindsay teaches the ways of God as to how He deals with human beings by analyzing the lives of the men and women of the Old Testament. Over a period of months, Maoz partners have invested in the funding of 22 of the 37 books to be translated into Hebrew. The funds for the 22nd book was raised by a women’s bible study group! 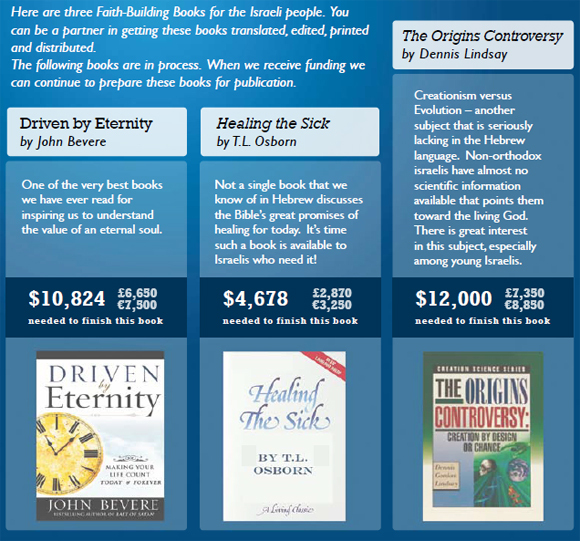 Perhaps you are a part of a group or congregation that together could raise the funds to print one of these books. We have just 15 more to go – to finish this immense project for the Israeli people! You can be a part of this major endeavor to complete the funding of this Bible series. Make sure that your estate goes to the people you love...and the places you desire…instead of the IRS and probate court. Did you know that without a will the government will decide who will receive the assets you have worked a lifetime to accumulate? Surprisingly, nearly 50% of all Americans do not currently have a valid will in effect... even fewer have an estate plan. Without these documents, you run the very real risk of having someone you don’t even know decide how your estate will be divided... someone who may not share your spiritual values and beliefs. A living trust will transfer your estate to your loved ones more quickly upon your death and proper planning could save your heirs many thousands of dollars in probate court fees, probate attorney fees and taxes. And you get to choose where your investment in the Kingdom of God will go. 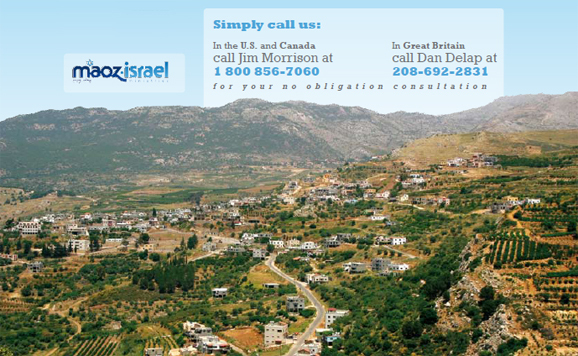 As a part of your legacy, you can invest in bringing redemption to the Israeli people for years to come! Our planned giving department can assist you in creating an estate plan which will ensure that your final wishes are carried out. you can do for yourself and for your family. The United Nations says Haiti’s earthquake is the worst disaster it has ever had to deal with. The world, and specifically religious institutions and individuals are doing all they can to relieve the unimaginable pain and death. Paul says that one day creation will be set free from its slavery to corruption. But when will that day come? When will the suffering of mankind end? This Gospel of the Kingdom shall be preached in the whole world for a witness to all nations, and then the end shall come. Who doesn’t want to see suffering end? Who wouldn’t do his part to help end the tragedies and atrocities in every nation of the world if he or she knew what more to do? Yet, there it is. The one overarching solution. Get the Gospel out – in every way – as a witness to every nation. And in God’s word, He gave us one of the main strategies to this Great Commission: The Gospel is to go to the Jew first, and then to the Greek (the nations), promising that Israel’s salvation will be riches for the Gentiles – actually, life from the dead! So what can we do? Here is one very practical way to bring the Gospel to Israel. God has given us the written language – so that those gifted with teaching and preaching within His great Body can get the Gospel out throughout the nations. Books are one of the most important tools He has given us. So we in Israel are using it! These books will help build up the Body of Messiah and give direction and inspiration to a new generation of Israeli leaders. Will you partner with us to finish the publication of these books in Hebrew? We pray that the Gospel will be proclaimed throughout the world, so that our Messiah will bring an end to the suffering in this world when He establishes His Kingdom in Jerusalem!